If you sweat more than other people when it’s hot or you’re exerting yourself, that’s not cause for concern. Sweating is a normal reaction when your body is working hard and needs to cool itself down. Excessive sweating is usually defined as sweating an amount out of proportion with the temperature of a room or your activity level. Besides disrupting normal daily activities, excessive sweating can cause social anxiety or embarrassment. Sweating that exceeds beyond the needs of the body—medically termed as hyperhidrosis—is fairly common but not a good sign. It affects 1%–3% of the population. Hyperhidrosis may be generalized but, most often it involves the palms, underarms, feet, and groin; it can take a social toll, making handshaking unpleasant and some handwork impossible. Sweating helps the human bodies stay cool. In most cases, it is perfectly natural. People sweat more in warm temperatures, when they exercise, or in response to situations that make them nervous, angry, embarrassed, or afraid. Excessive sweating occurs without such triggers. Persons with hyperhidrosis appear to have overactive sweat glands. The uncontrollable sweating can lead to significant discomfort, both physically and emotionally. When excessive sweating affects the hands, feet, and armpits, it is called primary or focal hyperhidrosis. In most cases, no cause can be found. It sometimes is genetic and runs in families. Excessive sweating also occurs as a result of another medical condition such as Diabetes, Endocarditis, fever of undetermined cause, heart attack, menopause, Hyperthyroidism, obesity and stress it is called secondary hyperhidrosis. The sweating may be all over the body or it may be in one area. Hyperhidrosis is a very real and embarrassing problem, but there are some effective ways to treat it. Before you hide under bulky sweaters or move to a chillier climate, you can try these proven techniques for combating excessive sweating. 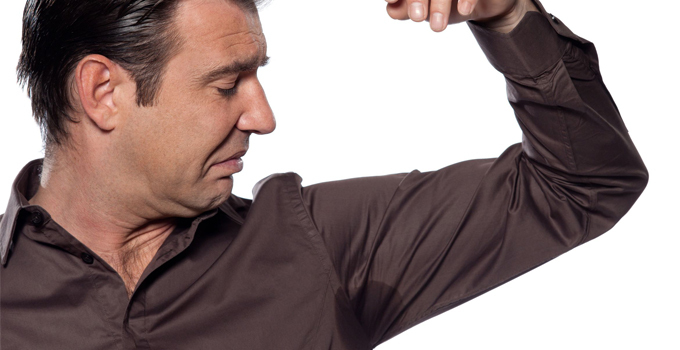 The easiest way to tackle excessive sweating is with an antiperspirant, which most people already use on a daily basis. Antiperspirants contain aluminium salts. When you roll them onto your skin, antiperspirants form a plug that blocks perspiration. Many antiperspirants are sold combined with a deodorant, which won’t stop you from sweating but will control the odour from your sweat. As I said, you already know how to prevent your sweating problems. You do not interfere with information you already know. You know that antiperspirants can prevent excessive sweating. But did you know that anti-perspirants based on aluminum chloride block your sweat glands! These types of antiperspirants can treat moderate cases of perspiration. They often come in the form of a rolling solution, which you apply just before going to bed, and then wash in the morning. You can collect them from your local pharmacy for a small amount of money, and they should last about a month!